Hello all! Hope you all are doing well. 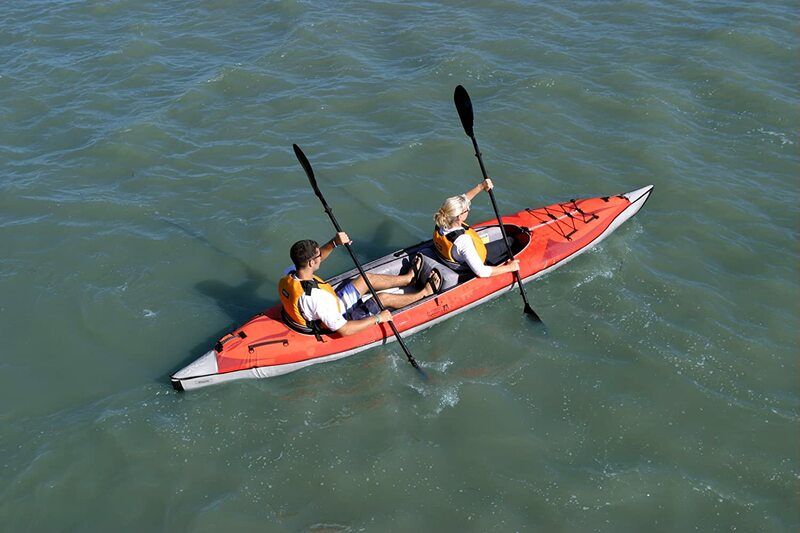 Our today’s topic is advanced elements advancedframe convertible inflatable kayak review. So dear review seekers let’s begin our journey. One of the highly loved inflatable kayak from Advanced Elements, the AdvancedFrame Convertible is robust, stable and balanced enough. This is an excellent looking tandem kayak, and this is meant to be paddled perfectly by two people, but it can be paddled solo as well. It’s a lot heavier in comparison with other inflatable tandems, so paddling this one solo can be quite tricky. Just like the other Expedition, this kayak is a hybrid mix of a foldable and as well as an inflatable. Most of the inflatables you may see ride today ‘on’ the water, but you have to thank the built-in aluminium frame the Advanced Elements Convertible rides ‘in’ the water. This kayak is 15 feet long, and this is made having heavy duty materials along with three layers of puncture resistant material. You can also treat this kayak like garbage, and it will still float on water. The fabric on the outside of this kayak is PVC Tarpaulin covered with 1000 denier polyester. Besides, there’s an additional double layer of material on top of that. They have added landing plates to the bow so that they can make it more durable and stern to protect the hull of the kayak from rocks and other dangers on the water. You can use this kayak in lakes, oceans and rivers obviously with class 3 rapids. The tough hull makes scraping against rocks and other rough objects which used to be a worry of the past, so in case of your going down a class 3 river is nothing to worry about at all, your kayak will survive anyway. You have to thank the aluminium frame inside this kayak; the kayak glides through the water with ease as like a knife through butter. You have to combine this with the skeg, and you have an inflatable kayak that will track almost as straight as a hard shell kayak. This kayak has a carrying capacity of 550 pounds, and it can also hold plenty of gear as well, even more, if you have a plan on riding solo. It contains a mesh pocket in the front, and if you want to install the additional deck, there will be two mesh pockets in total. One thing to bear in mind that when you are purchasing the Advanced Elements Convertible is that there are no accessories included. Gears like paddles, pump, spray skirts, and the additional solo deck are all sold separately, which will surely bring up the cost around a hundred dollars. On the other side, you will get to choose exactly what you want; there is no need to be stuck with low-quality oars or a pump which will break on you. The Setting up of this kayak is simple and straightforward. Even though as we have informed you earlier that it has a built in the aluminium frame which is very easy to unfold and start inflating. From the unpacking of it to fully boosting it will take you maximum 15minutes, it all relied on how much fast and experienced you are. We can typically inflate most of our kayaks in 10-15 minutes, but you have to notice that we’ve been kayaking for years. So don’t be surprised if it will take you 20-30 minutes the first time! We all love to be able to recline in our chairs when we take a rest, but it may not be possible to find a comfortable position for our relaxation. The seats are still very comfortable, especially when you are comparing them too hard shell ones. The included places have no lumbar support, but it’s possible for you to buy it as an extra accessory. At least this is as close to a convertible as you’re going to get in an inflatable kayak. Although it is nicely fitted with two seats and best paddled as a tandem, one of the positions can be easily removed, and the other moved to the centre for the solo use. There are an optional solo and tandem decking that can be easily purchased to go along with it. When this inflatable is paddled solo, we found that it took more effort to get moving because of the sheer length and weight, but once you get that excellent glide going, it feels quite nice. When you paddle it as a tandem, it is capable enough of really picking up some excellent speed, especially of flat calm water. Already being standard with this model is a more closed-in feel with the more extended decking. You can even purchase separately solo or tandem decking that completely closes the top except for the cockpit. There are very few inflatable kayaks that offer this feature, and it is a nice one. The added decking adds on weight but makes it look fantastic and also provides more protection from the elements, which I have to admit is a real bonus. If you have previously paddled a hard-shell kayak, you might appreciate that the Convertible sits are relatively low in the water making it very easy to paddle and manoeuvre. It provides a lot more ‘authentic’ kayak feel, which for some is very important. In my experience even if you are used to hard-shell kayaks, you can get comfortable with an inflatable very quickly no matter how the design is. The back support that is offered by the included foam seats is proper. The back of the seat also comes about halfway up your back when you sit against it. I like a slightly higher return personally for great support. There have been a few complaints that they get a little bit uncomfortable after paddling for a while. If it becomes an issue for you and you are making longer trips you could look for other seat options every time, but for general paddling around they are just subtle enough. There is a tiny storage area for you under the decking right at the back and right up front also. 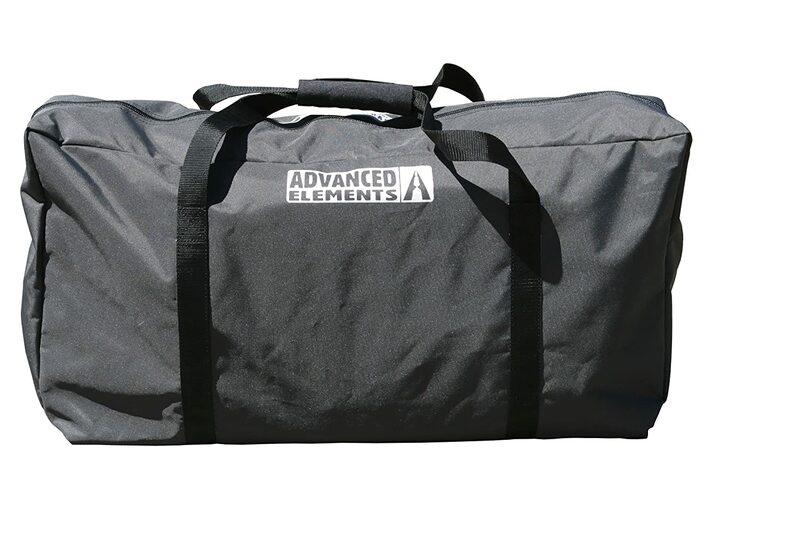 It may not be huge, but this can hold a small to medium size dry bag or two for you. You want to secure more gear on top of the decking under the front bungee cords or just tied down with some decent clip you can do that too. You will face No problem loading it up as it can hold up to 550 lbs. It also has an adorable tapered pointy bow and stern for your comfort and a decent size skeg as well, both of which will surely help with the tracking and speed. Indeed it may not be the fastest kayak out there, but it is neither nothing to complain about. The carry bag which comes with the package is made of durable nylon and has relatively heavy duty handles as well to carry it. The bag is not so fancy, but it easily fits the Convertible when the kayak is deflated and completely rolled up. There is Built in an aluminium frame which makes the bow and stern rigid and also helps the kayak to track in a much better way. The materials can genuinely take a beating, rock and stones may break your bones, but not your inflatable kayak! This kayak can go up to class 3 rapids. 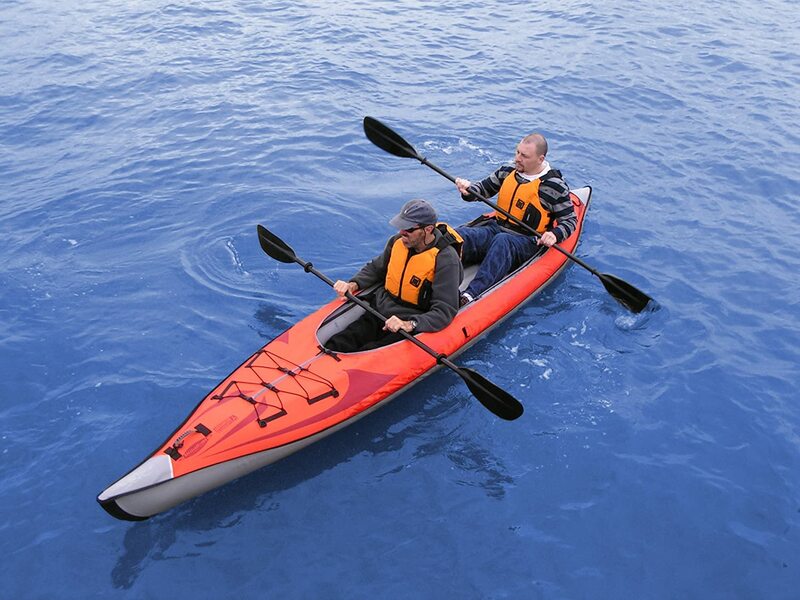 This kayak is a well built and long lasting inflatable tandem kayak. Because of the weight and size, it may not be a speed demon, but we never meant for that either. The 1007-R is intended for people who are looking to get out on the lake and enjoy a beautiful day, and occasionally take it down a river or two. It may cost a little bit more than your average inflatable tandem, but for a better reason, this is built like a tank, and this will last for many years. 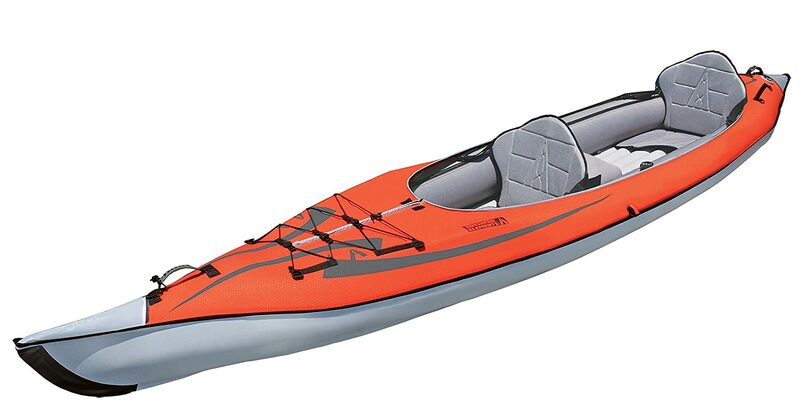 Advanced Elements AdvancedFrame Convertible Inflatable Kayak Review will let you know the Infrastructure, all the advantages, special features, specifications, advice for you, pros and cons as well.